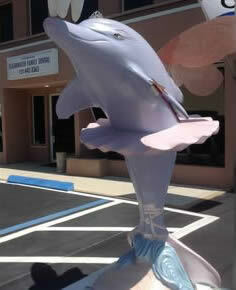 Hey, good morning Here I am with the dolphin — check this thing out: it’s a tooth fairy dolphin; isn’t that the best! Clearwater Family Dental get my teeth fixed. What an awesome place – these guys know their stuff; if you need a dentist come on by! Keanan Kintzel, after having work done on his teeth, stops outside to talk with Clearwater Family Dental’s dolphin mascot Toola. Toola is a landmark in Clearwater, and is also a Pokestop for Pokemon Go. She is as recognizable as Clearwater Family Dental is popular. Clearwater Family Dental are a dentist office that people like going to. They do really good work and they have an excellent team that make you feel welcome from the moment you first step through the door, through your treatment, and through your aftercare as well. Buzzazz Business Solutions Helping Clients To Help More People, Call Today! Buzzazz Business Solutions loves working with companies that really have a positive impact on the local community, and this is very true of Clearwater Family Dental. Paul and Ginger Rodeghero have created a welcoming and professional environment where patients are confident that they are going to get the best care for their teeth. If you would like to know how Buzzazz Business Solutions can help you to help more people, please contact us today!